Where do visitors to your site come from? 67 percent of search engine users are driven to search by an offline channel (direct mail, print advertising, radio, TV, etc.). This means that over half of the people that search for information about your products or services were triggered by offline information. Powerful statement for old media. Search marketers may be ignoring the offline channels that drive users to search engines. 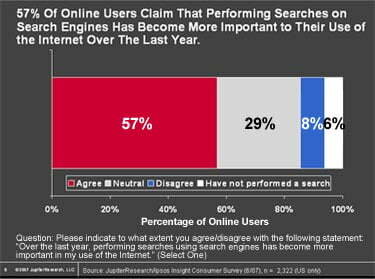 45 percent of search engine marketers do not integrate search marketing efforts with offline channels. Marketers attribute the lack of integration to various factors, including lack of budget and separate people managing search marketing and offline channels. Don’t be part of this major disconnect, improve offline and print marketing to reinforce your online business presence. The SEO team should be integrated with your print marketing team. 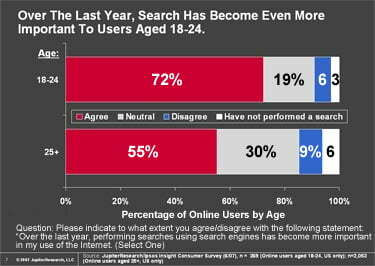 57% of users claim search engines have become more important to their use of the internet over the past year. 72% of the younger age group of 18–24 year olds reported a growth of importance in performing queries on search engines to find information and make purchasing decisions. This study was researched by iProspect. Yep great post and just shows the importance of online and offline integration. I have written a post on social, seo, ppc and offline integration that shows a correlation in buying patterns between visitors. Our dental assistants site gets most of its traffic from Google, even thought we do multiple media buys. Do you know if iProspect has a full text available?